Sussex Central High School students wanted to recognize the help they have received over the years from Beebe Healthcare’s Population Health Department, so they nominated the team for a Students in Action award. The Students in Action award recognizes people and organizations that help develop high school students into community leaders. Launched in 2006 by the Jefferson Awards Foundation and Deloitte, the program encourages students to make a positive impact on society. Each year, Beebe’s Population Health Department works with Sussex Central High School students to plan a health fair, which provides information to families about nutrition, exercise, and healthy lifestyles. The Students In Action team at Central awarded Beebe’s Population Health Department during a surprise announcement at the Health Fair where students, faculty, staff, local organizations, and community members were in attendance. Beth West, RN, a clinical nurse with Population Health, said she is proud of the students because they work hard to make each health fair a success. West has talked to students who plan to go into the medical field as nurse practitioners, cardiac surgeons, pediatric gastroenterologists, and more. Sen. Ernie Lopez, R-Lewes, presented the award to the nurses and talked about the importance of outreach programs and health fairs. Beebe's Population Health Department supports our charitable mission to encourage healthy living and prevent illness among residents and visitors to our community. Beebe provides a range of free health screenings throughout our community, including blood pressure, cholesterol, osteoporosis, and skin cancer screenings. To schedule screenings for your group or event, please contact Beebe Healthcare's Population Health Department at (302) 645-3337. 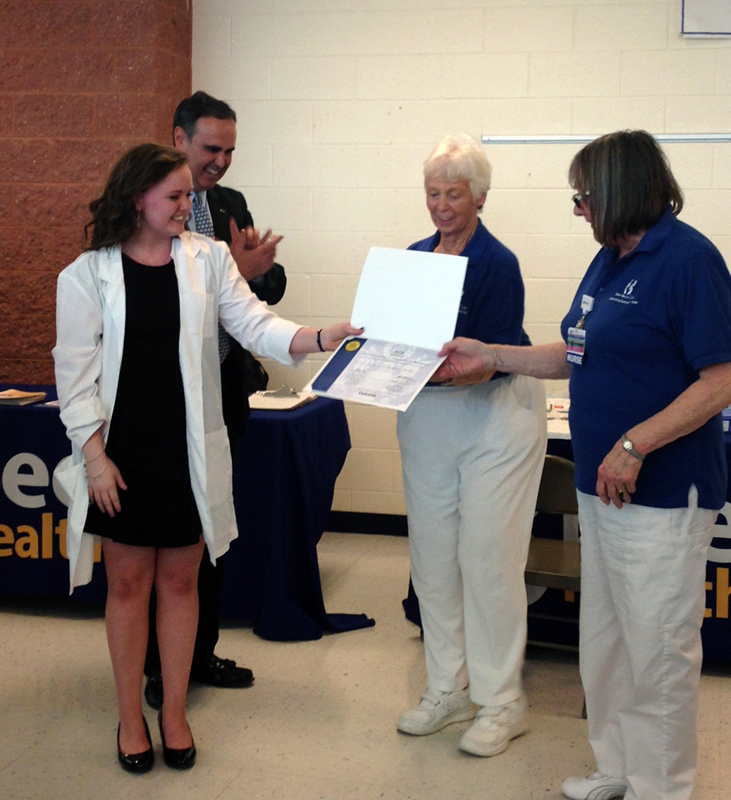 Caption: Sussex Central High School student and Students in Action Chapter member Samantha Franklin presents Beebe Population Health nurses Doris Hensler, RN, and Beth West, RN, with the Students in Action award, as Sen. Ernie Lopez watches.